I am a follower of this blog and I have my badge here. I am a follower of this blog and I list my badges in alphabetical order here. Guess what day it is? Well, it's not hump day! ;) lol It's Sunday Release at DigiStamps4Joy! The image is Parisienne Bistro. Nice! 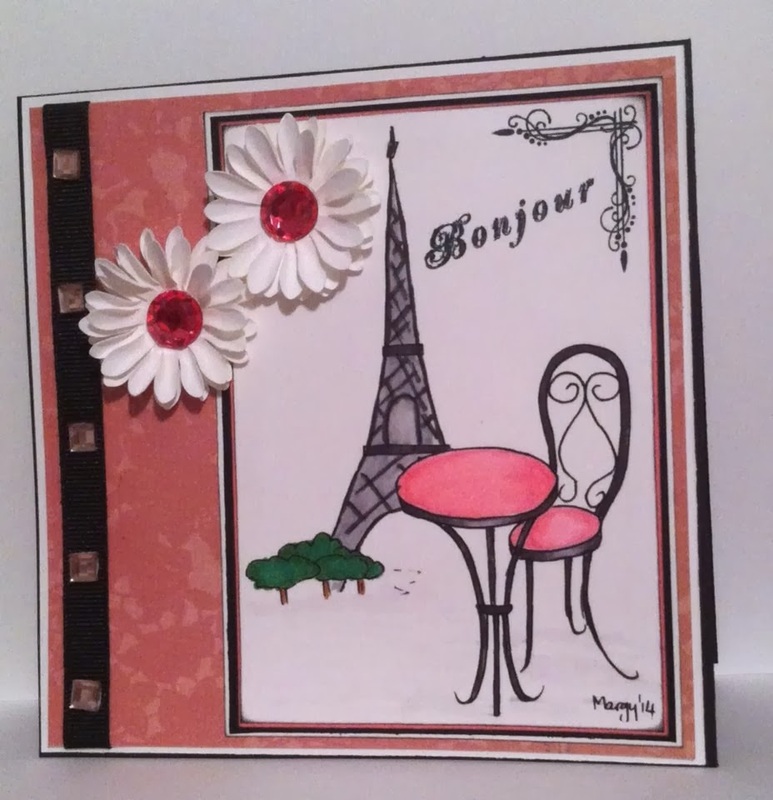 I used a Crafty Secrets clear stamp set called French Mail Stamp Set to stamp the Bonjour in the corner along with the corner flourish. I colored the image with Copic markers. I added a black grosgrain ribbon and embellished it with some square pink rhinestones. I made the flowers from a Michael's Recollection daisy punch and added some large pink rhinestones for centers. I am a follower of all these blogs and I list the badges in alphabetical order here. 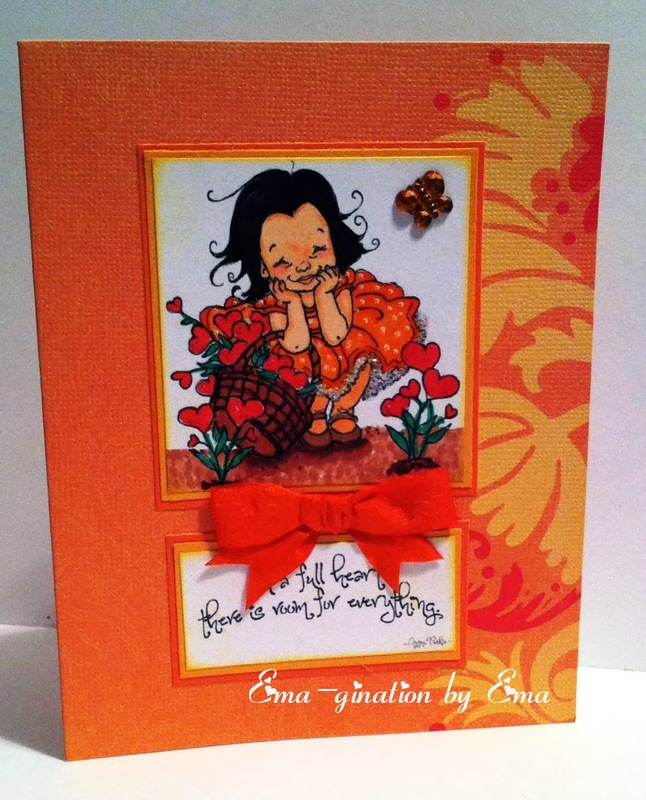 This card is for the monthly challenge at From the Heart Stamps Community. Faith Skrdla will gift you a digital image for each month you participate in the challenge. Isn't that way generous of her?!? It is a progressive challenge that started in September 2012 and at the time, the first image was free. Imagine my disappointment when I discovered this in January 2013. In order to receive the freebie, you must make a purchase and request the freebie of the month, and as long as you continue participating in the challenge, you'll receive a free digi each month. I've colored the image with Copic markers. The three plastic hearts are from a Michael's Recollections embellishment package. I made the flower with a Michael's Recollections daisy punch as well. I punched several flowers, misted them with water to dampen the card stock, scrunched the petals inward and glued them together by alternating them on top of one another. I then finished this by adding a rhinestone to the center. 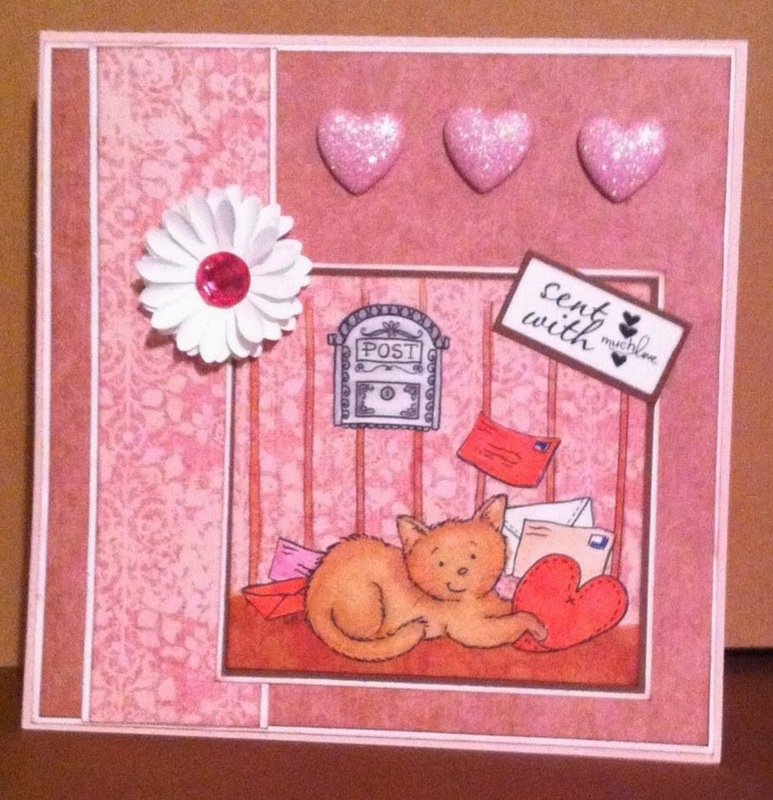 The sentiment is from Love You Sayings by Raindrop Echo Designs at Whimsy Stamps. The paper is from K&Company Ancestry.com Designer Paper. I don't mind telling you, I love how it came out! I think it looks so elegant! Aren't I just so full of myself? I couldn't help it. 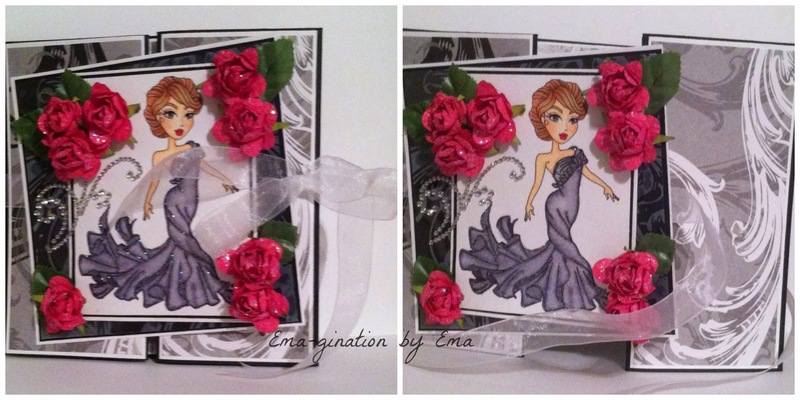 I didn't plan to add so many flowers but I used acetate on the background and the matted image started to pop off! I didn't know it would do that. I should have researched the technique a bit before deciding to use it. By the way, her gown is gray. I had someone on FB tell me it was such a great shade of purple! Ha! All the supplies are from my stash and I colored the image with Copic markers. I outlined her gown with Stickles in Stardust and dabbed her gray eyes with Glossy Accents. I also dabbed the flowers with Stickles for some added shimmer. 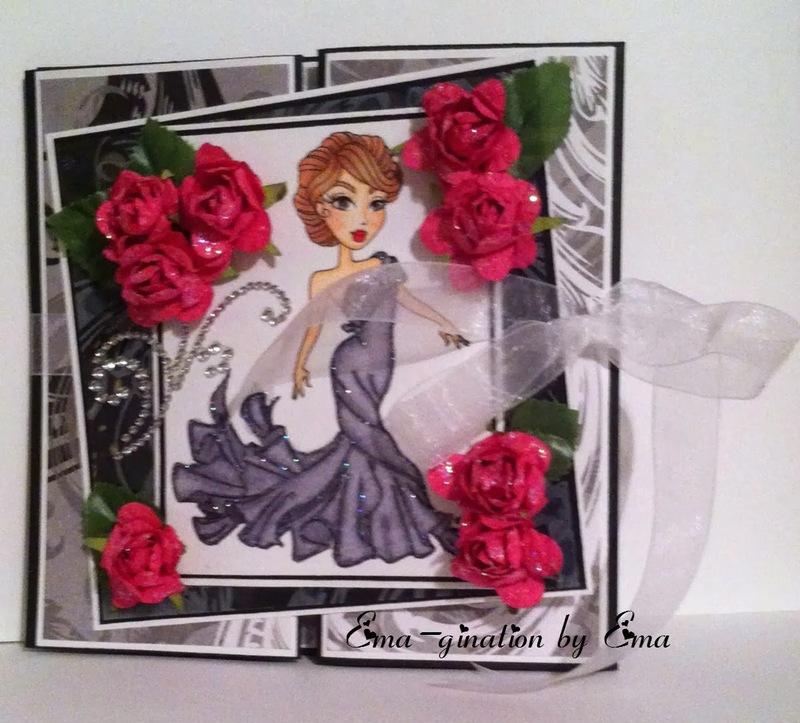 I used a tutorial from Whiff of Joy for the card fold and you can find the tutorial here. I am a follower of these blogs and I list my badges in alphabetical order here. Yay! Anything Goes! I just love these challenges! Almost as much as MelJen's adorable images! 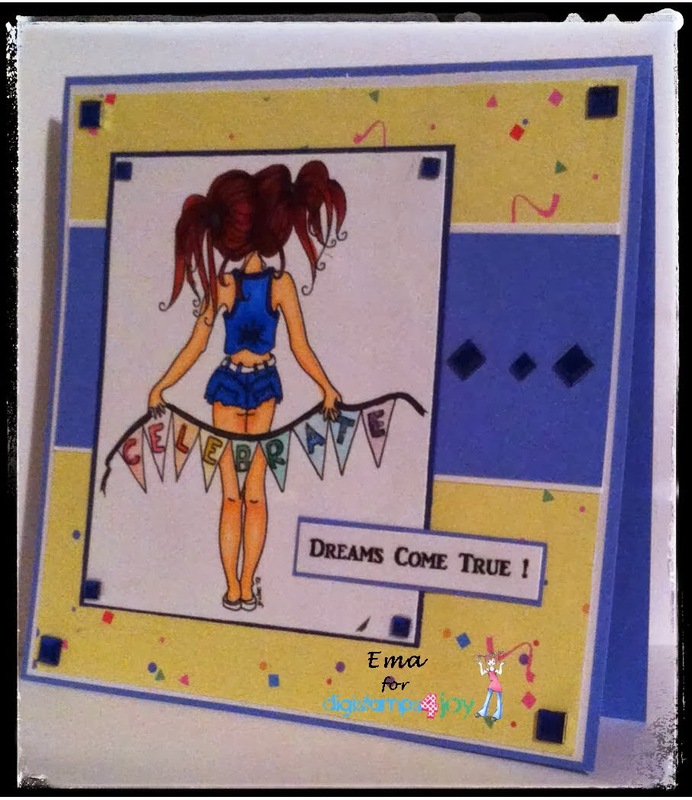 This is for MelJen's Designs Challenge #191 - Anything Goes. 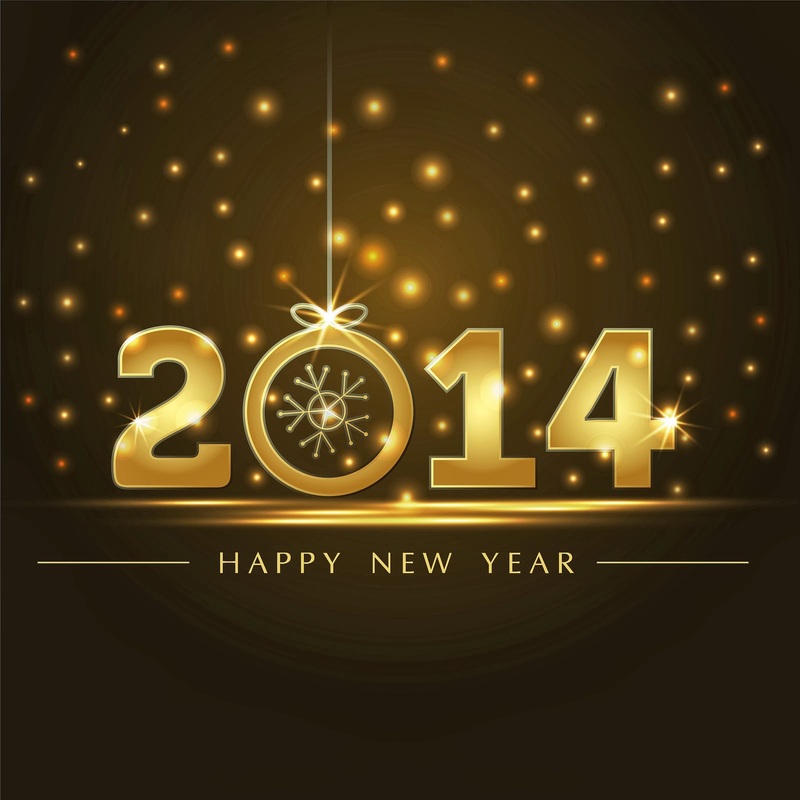 Welcome back friends and fellow bloggers! Today launches a new era for Fitztown Challenge Blog. I hope you'll pop on over there and check out all the changes. I've used a FAE image from the Fae Collection at Fitztown. I've colored it with Copic markers and outlined the wings and gown with Stickles Glitter Glue in Stardust. I dotted the center of the flower with Stickles Liquid Pearls in Buttercup. 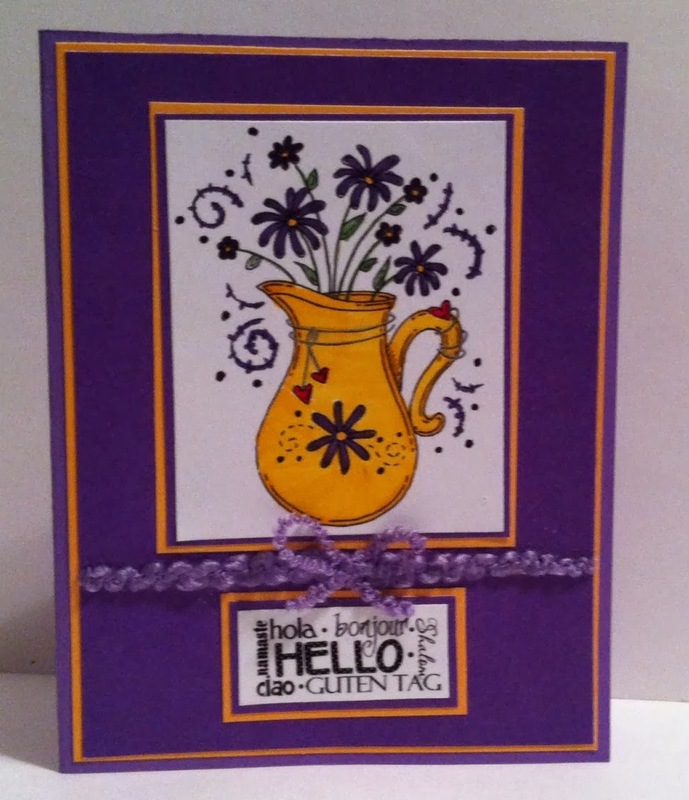 I added a lace border with a Michael's Recollections border punch. 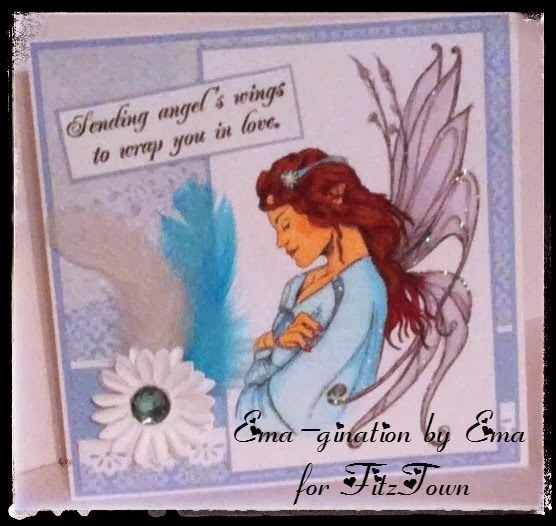 The sentiment is from a retired stamp set at The Angel Company (TAC). TAC is closed but you can find many of these images at Red Rubber Designs. I used to LOVE TAC so when I found this out, I was thrilled! All other embellishments and papers used are from my long-hoarded stash of craft supplies. 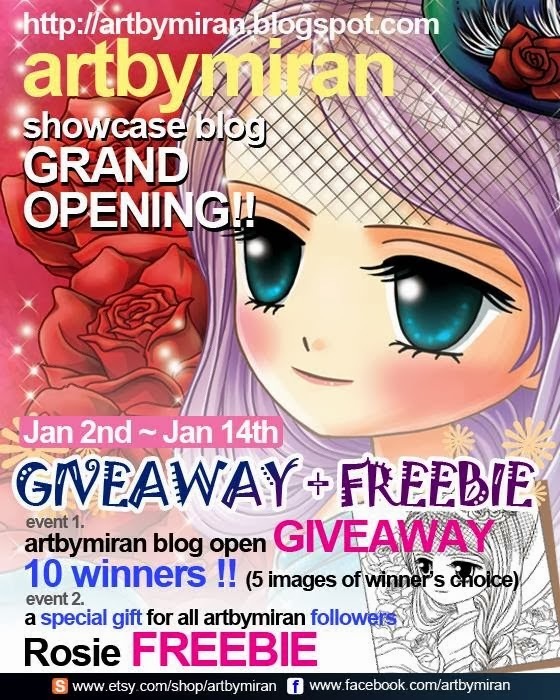 Welcome friends and bloggers! :) It's Sunday Release at DigiStamps4Joy once again. Here I have Martini - Who Me? Isn't she too cute?!? Who loves Mo Manning images? Me! lol Actually, I have many, many favorites but in reviewing my process of wanting to post a project every day this year, I had to make some tough choices. First, no more weekly challenges. Too stressful! Unless it's one for a company I love... or I blog for already... and I do for a couple! ;) Second, well come to think of it there is no second. Unless you count the challenges that are for every two weeks. Those I may still do but again, only if it's for companies I love! :) I love a whole bunch too so that may turn out to be a problem anyway but we shall wait and see. I wrote a post about all the cards I've made in 2013 earlier today and I added the disclaimer that there may be cards scattered about my home that were missed in the count. This was one of them. I thought it was in the batch I counted but I cleaned off my desk just now and found this one along with five more Christmas cards! 8-O This one was for a challenge and I thought I'd already blogged it too! Cut off is in a couple of hours so I hope I can get this written and posted in time! Isn't she cute the way she's peeking out of the stocking? I love it! 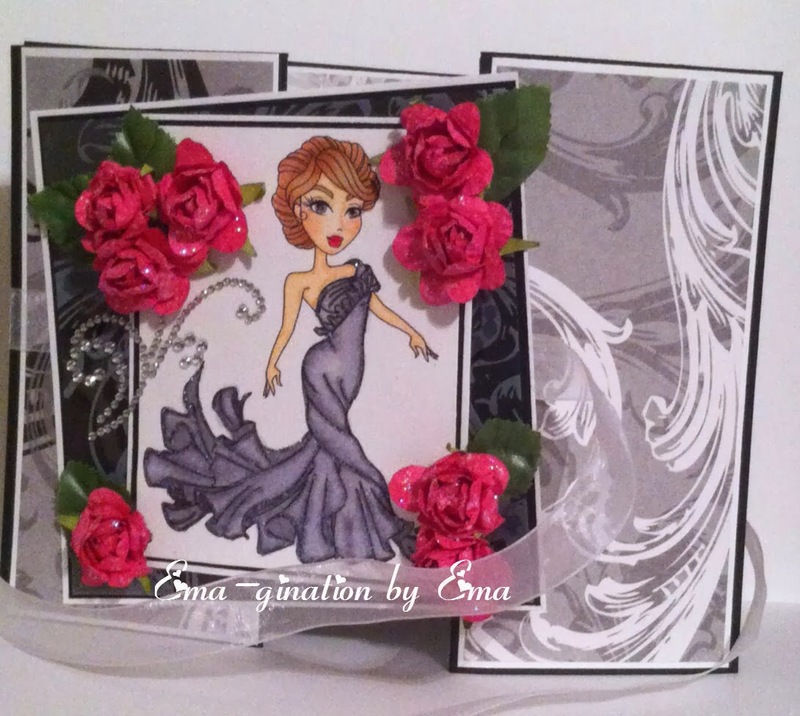 Ribbon and printed and glimmer card stock are from my stash. The bling was a Christmas gift from a friend. The sentiment is from Create with TLC. I've colored the image with Copic markers. 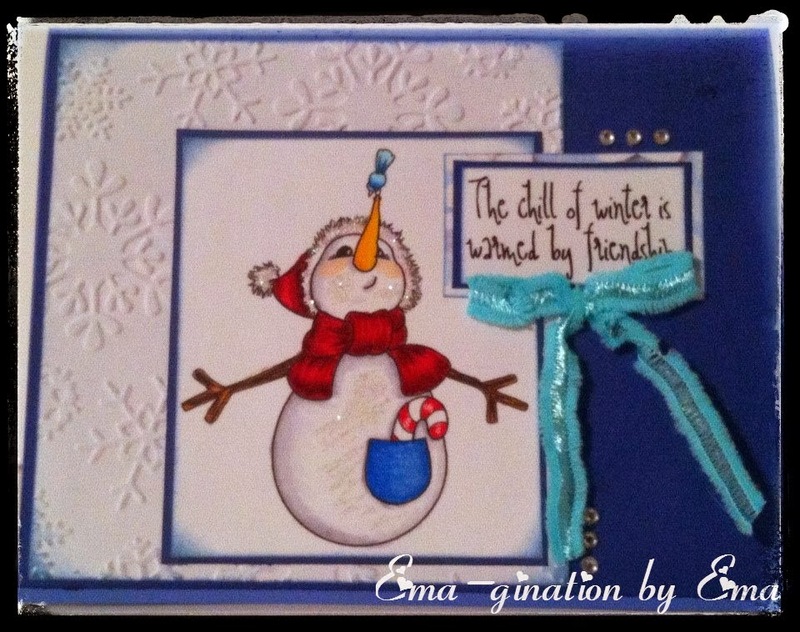 I used a Spellbinders Classic Scalloped Circle SM to mat the sentiment. I've had a really hard 2013. Yes, I was declared in remission on September 19, 2012 but what good did that do me in 2013!?! The chemo drug I was taking in 2012 messed with my heart and so I had to get off that chemo and start a new one. The three weeks I went without any chemo were the best three weeks of 2013! Made me realize, the fatigue, headaches and muscles aches were NOT just because I had CML! I felt badly because of the SIDE EFFECTS! So, I started a new chemo drug in June. This one had even more troublesome side effects. My oncologist has been telling me since then, it will get better. My body has to get used to the medication. Ha! I've spent the last year of 2013 having a fantastic pity party and done everything I could to keep from inviting everyone I know! It's not that I didn't make a heap of cards in 2013. Because, trust me on this one, I did! I was curious to know exactly how many. So I counted. I took inventory of the cards I have on hand. These alone number at 221... and that's if they are all in the same place. Sometimes, I forget to add them to the stash after I photograph them and I didn't really have a look around. Then I went and looked back on the cards I gifted and sold and these number at 102. If I include items I altered, there were seven items. Then I participated in a swap online. I host an ABC swap with some "imaginary" friends in a private group in Facebook. I've sent out on average about six cards in each swap. Sometimes more, sometimes less. We took a summer break, but we did swap for nine months. So I think maybe in total about 36 cards, give or take a couple but I really think I'm being conservative here. Then I had pen pals I swapped cards with... three pen pals at an average of about a card a month... so we're talking another 36 cards, conservatively. Now... some of these I did blog about... but not Every. Single. One. I didn't include the 10+ cards sitting on my desk waiting to be completed. 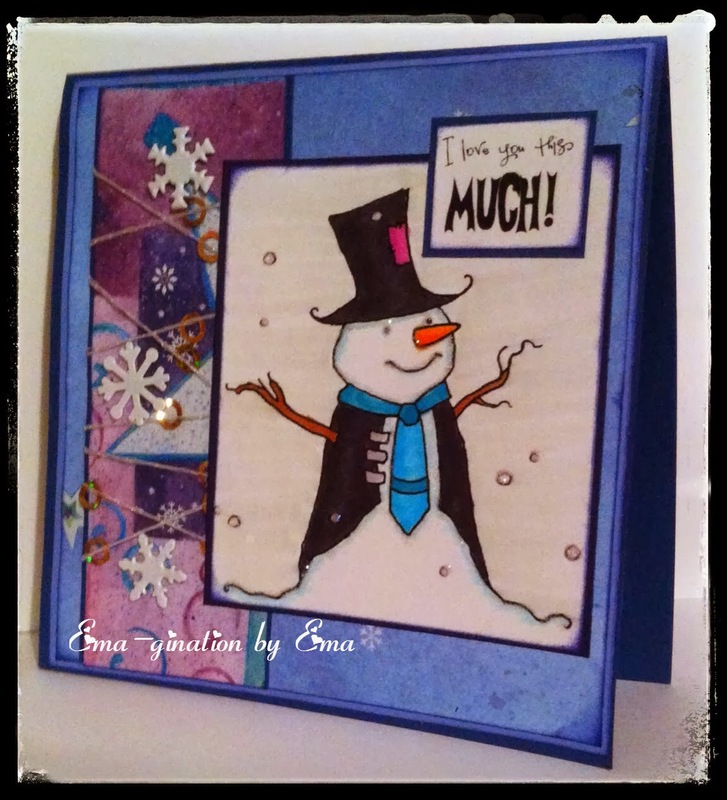 These have been put together with maybe missing some embellishments or sentiments. But I did not include these in the count. As I look back over my crafty year, if I had blogged about each and every one of these cards or projects... I could have easily met my goal. Ssooo... it turns out... maybe it was the DISCIPLINE I lacked! *blush* Again... not to rehash my health issues... maybe I should have pushed myself harder to follow through. But then again, here I am pushing myself to finish writing this post. :-\ It's a lot easier to write that than to actually follow through on it. Oh, by the way, I did write 258 posts... I didn't include the ones I've written on the Fitztown Challenge Blog (FCB)... and there were a few I'd written for another challenge blog but I didn't count those... but if I had included the ones from FCB, that would have been about another 75. Nonetheless, I was short 107. I. Could. Have. Made. It! My goal was just to post something each and every day. So it's just a matter of pushing myself a little harder this year... I think I can do it! This is the year I am overcoming all the side effects from the chemo I'm on currently. I. Will. Do. It! I! WILL! So with all that written, storage has become a HUGE issue for me. Here's how I'm storing my cards... but if I plan to repeat the process this year... something MUST be done! :-\ This won't work much longer!